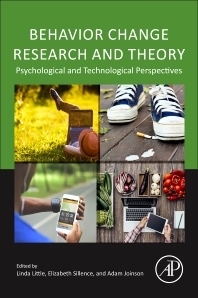 Behavior Change Research and Theory: Psychological and Technological Perspectives provides a unified account of behavior change theories and broad coverage of application domains and best practices. From a psychological and human-computer interaction perspective, the book puts a strong emphasis on the psychological foundations of behavior change, and explores the relationship between technology and behavior change. It will cover the major behavior change theories: planned behavior; health belief model; protection motivation; transtheoretical; and more recent approaches to behavior change like Nudge, and Mindspace. The section on health research and behavior change will cover interventions like diet and fitness, mental health, smoking cessation, and diabetes management. Topics also include financial and security research, and behavior change in relation to financial and other forms of sensitive information (passwords, phishing, and financial transactions). The last section will highlight the challenges and opportunities afforded by the increasing use of mobile technology with respect to the design of programs and apps aimed at facilitating behavior change and the role of social media. What’s in a behavior change intervention? Linda Little is a Reader and Chartered Psychologist and an Associate Fellow of the British Psychological Society. She teaches Social Psychology at both undergraduate and postgraduate levels in the Department of Psychology, Northumbria University, UK. She is also an Associate Director of the Psychology and Communications Technology (PaCT) Lab. PaCT Lab is based at Northumbria University and is one of the few HCI (Human Computer Interaction) research and training facilities within a psychology department. Linda’s main research areas are behaviour change techniques, privacy, trust, technology use in public places, the impact of age and disability on technology use. Her research has been funded by major research grants from the ESRC, EPSRC, MOD and industry. She has attracted (as PI and CoI) grants totalling approximately £1.7 million and published widely in the fields of accessibility, privacy, security and trust. She has developed new methods for assessing existing and future technologies. Linda has also worked with local companies increasing the research capacity and culture of the North East. Linda has undertaken consultancy work and regularly presents her work at national and international conferences. Elizabeth Sillence is a Senior Lecturer in Psychology at Northumbria University, UK and a founding member of the PaCT Lab (http://www.pactlab.org.uk). Her research interests are centred around trust and social exchange within e-health environments and she is currently examining the role of online patient experience on behaviour and decision making. Liz has published over 50 articles on trust, advice, decision making and online communication and has also written on ethical issues in mobile human-computer-interaction.